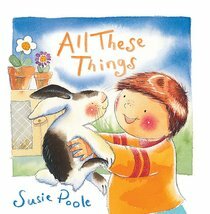 About "All These Things (Pupfish Series)"
Customer Reviews For "All These Things (Pupfish Series)"
Susie Poole has done a great job of making 1 Corinthians 13 and its theme of love accessible for the very young in the form of a board book with great illustrations, appropriate text and simple illustrations. I particularly like the way she introduces concepts such as persistence, wishing the best for others and selflessness in 'kiddy appropriate' language and examples. This is an excellent book you could give as a gift to any new parent with or without a Christian faith. If nothing else, many of the concepts may be recognised as those read at wedding ceremonies. An excellent book.